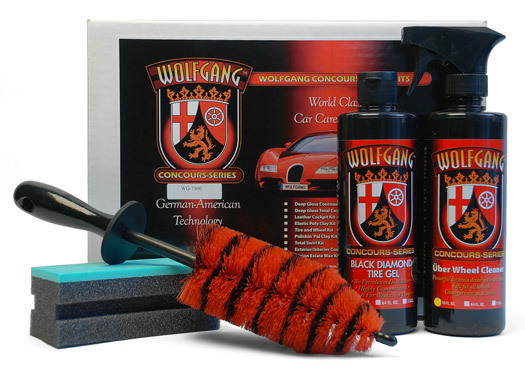 Carefully engineered wheel and tire care from Wolfgang! Their are few pleasures in life as rewarding as piloting down a twisty road in a carefully engineered sports sedan, feeling the power of the brakes as they haul you down from Autobahn speeds. Most sports cars and sedans use a soft touch brake system designed for maximum breaking performance. A side effect is that these systems throw off an incredible amount of brake dust. The Wolfgang �ber Wheel Kit cleans the most intricate wheel designs and protects the tires with a natural deep gloss so you can spend more time driving your ride the way it was intended. Wolfgang Uber Wheel Cleaner 16 oz. Wolfgang �ber Wheel Cleaner will remove the most stubborn brake dust from even the most delicate wheel finishes. It was designed to combat the heavy brake dust load of European sports cars, so it is perfectly capable of cleaning the wheels of any automobiles. The non-acidic, pH neutral formula changes colors as it it attacks brake dust while remaining gentle to the most delicate wheel finishes. Wolfgang Black Diamond Tire Gel 16 oz. Wolfgang Black Diamond Tire Gel consists of German super polymers, deep conditioning agents, and cutting edge protectants. Wolfgang Black Diamond Tire Gel penetrates beneath the surface to give your tires a long-lasting true glow that lasts weeks rather than days. The dark, satin finish will last through rain showers and car washes. Less mess is the goal when it comes to applying tire dressings. Flex Foam Tire Dressing Applicators feature Flex Foam Technology� which hugs the curve of the rubber to apply an even coat of tire dressing with no drips or pooling. Dense cells to keep the tire dressing near the surface to provide even, thin coverage of tire dressings. The foam is indented on each side to provide a place to grip the pad. Use the latest in German-American technology to keep your wheels clean and your tires protected. The Wolfgang �ber Wheel Kit is designed to reduce cleaning time while remaining safe and effective against the most stubborn brake dust. Spend more time enjoying your ride without using harsh acids and silicone laden dressings with the Wolfgang �ber Wheel Kit.